Buy paper copy or download the entire book as a COMPLETELY FREE PDF! The print version is a high-quality, perfect-bound, crisply-printed, 366-page book. The eBook version is an instantly-downloadable, searchable PDF (not scanned from print or anything nasty like that). 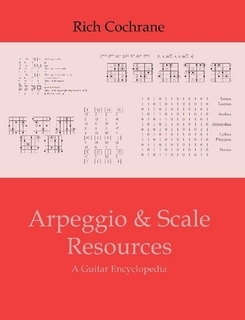 You can now get the most comprehensive, complete scale and arpeggio book ever published for guitar completely free! For a book to be an "encyclopedia" it should be complete and systematic. There are many commercial books on the market that call themselves scale or arpeggio "encyclopedias", but there are no good ones. Most of them just repeat the same few dozen scales as all the rest. A lot contain impractical or partial fingerings; some even have no diagrams at all. Many have confusing or incorrect explanations and analysis; that's if they have any at all. Some just cash in on a famous guitarist's name or hope you'll buy them because they come with a useless CD of examples. This book was written in frustration at the existence of so many poor-quality books. I'm a professional teacher, not a music publisher, so I can afford to spend 20 years researching and experimenting to produce the best-quality book available. I can also afford to let you download it for free, because frankly I'd rather have people use it. I'd be delighted if you bought a paper copy -- I get a couple of bucks for each one sold, so it would help me out. If you choose not to, though, that's OK.
Arpeggio and Scale Resources is divided into three parts: a short first part called "Fundamentals" and much longer second and third parts containing the advanced resources that make up most of the book. An explanation of basic scale theory, giving precise definitions to terms such as "gamut", "scale", "root note", "mode", "interval" and so on. The first chapter is a very thorough introduction to scale theory: it provides a solid foundation and ensures you'll never again be confused about modes, the most useful but also most misunderstood concept in modern guitar theory. I use this as the basis for most of my theoretical teaching with students who are ready for single-note work. Part 2 covers 200 pages and is full of strange and wonderful scales and arpeggios. It contains the following chapters, which are designed to be dipped into at random; all resources are given with full CAGED fingerings. Further arpeggios, including 9, 11 and 13 added to the triad, alterations of the standard triads and suspensions. All of these are considered "hypermodally", looking at all 12 possible applications of an arpeggio relative to a given root note. Every possible 3- and 4-note combination of notes is covered in this way. Every possible pentatonic scale that doesn't contravene the house rules (see below). Scale groups formed by altering one note from a common heptatonic scale: 5 from the major scale, 4 from the harmonic minor and 3 from the melodic minor. The 100-page Part 3 gives complete coverage of the hexatonic scales, and classifies them using a new framework based on higher-order symmetries. Although the theory behind this section is a little abstruse, the scales themselves offer many fresh possibilities for musical expression and exploration. Not many readers will need to go this far, but those who do will, I hope, find the coverage enlightening. When I say there are 1574 scales and arpeggios in this book, I'm not kidding. I'm not inflating the number by multiplying it by 12, just because you can play each one in any of 12 keys, and nor am I counting each of the 5 CAGED fingerings separately. I promise you there are scale books in a music shop somewhere near you that use both those tricks. Well, if I used them I'd be claiming to have 96,600 scales mapped out for you. But I'm not, because that would be daft. That's it -- those are the only restrictions, and they're there for what I hope are good reasons (I also break them quite a few times). The result is a vast catalogue of musical possibilities presented not in the way a computer or a maths nerd would present them (again, I hope) but in a way that hints at their musical possibilities. If you like it, please consider buying a copy of the beautiful, perfect-bound, crisply-printed book from Lulu.